What is it like being a boy or a girl? How do boys and girls learn to be men and women? How do families, schools and children’s peer groups influence the ways in which children think of themselves as male and female? 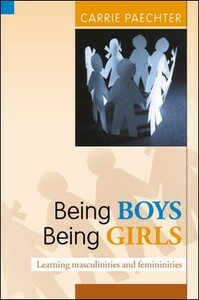 Being Boys, Being Girls explores how boys and girls learn what it is to be male and female. Drawing on a wide range of studies from around the world, the book examines how masculinities and femininities are developed and understood by children and young people in families, in schools, and through interaction with their peers. One of the key concepts underlying this book is that our identities are constructed and performed in particular ways which help us to understand who we are and how we fit in with the world. This means that these identities are constantly changing according to where we are, what we are doing, and whom we are with. Who we are, and what we think about ourselves, only makes sense in relation to what is going on around us. The author provides a clear explanation of the underpinning idea that children’s understandings of gender are developed and constructed in local communities of masculinity and femininity practice. She brings together research on children and their construction and understanding of gender across the 0-18 age range and includes explicit suggestions for strategies and interventions. This book is essential reading for students and academics in childhood, education and gender studies and for those with an interest in gender development and the construction of masculinities and femininities.